Hoover understands in One Touch Find out the most clever way to get the best for your laundry. 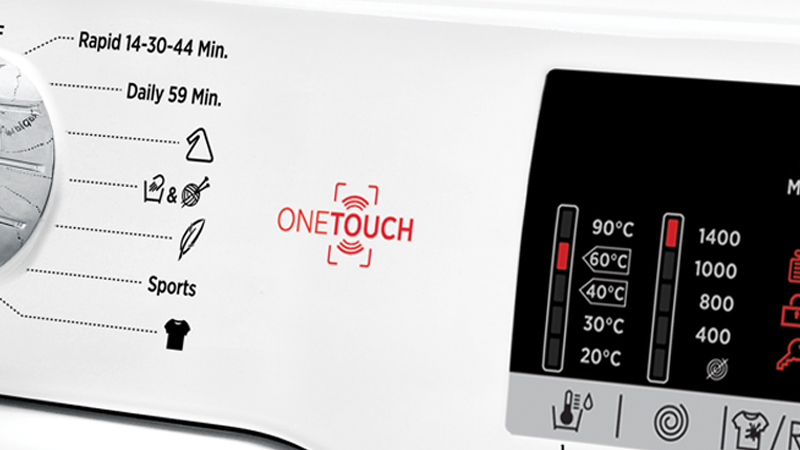 One Touch, the connection system with NFC technology keeps the state of your appliance under control for maximum efficiency and best results every day. Simply by downloading the Hoover Wizard App and placing your smartphone on the appliance, you can expand your washing horizons and ﬁnd the most suitable type of washing for your needs. 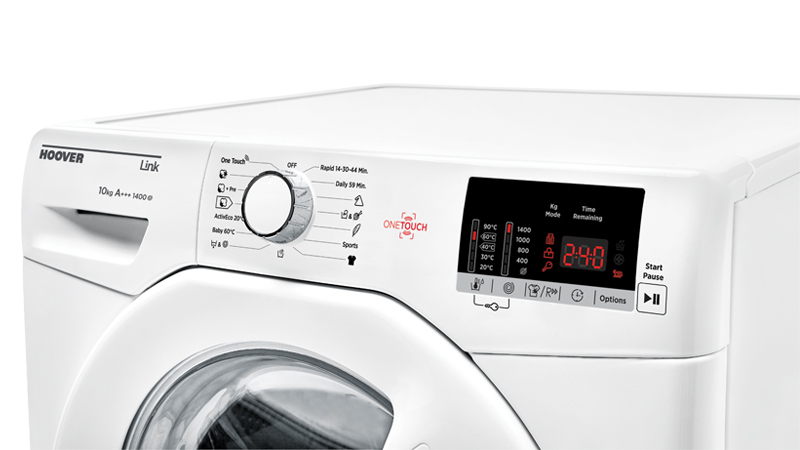 Featuring a range of load capacities, this range also offers Touch LCD displays, KG mode that weights your laundry and adjusts the time, water and energy required to do a perfect wash saving you time and money. All Hoover washers come with three rapid wash programs 14 minutes, 30 minutes and 44 minutes. This gives you the option of a quick wash to suit your needs. 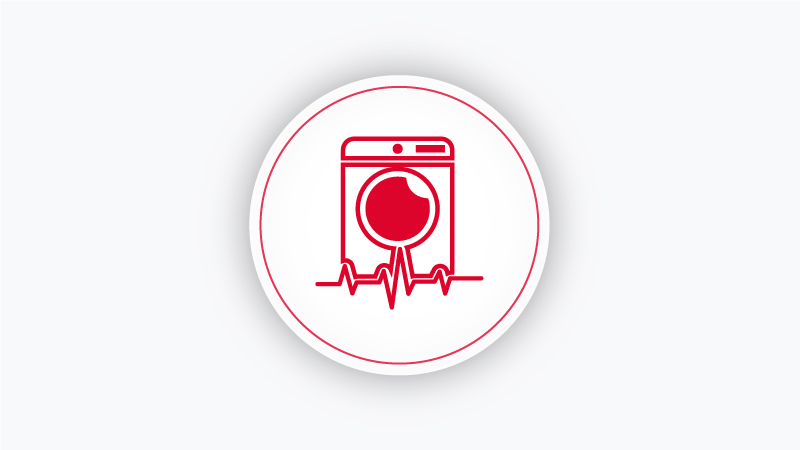 Delay the start of the programme by up to 24 hours, either from your smartphone or at the machine, and don’t worry about wet laundry sitting in the drum for too long again. This innovative programme, allows you to wash different fabrics and colours together, such as cotton, synthetics and mixed fabrics at only 20°C and provides an excellent cleaning performance. Consumption on this program is about 40% of a conventional 40°C cotton wash.
Hoover 10kg Washing Machine | DHL14102D3/1-80 is rated 4.8 out of 5 by 27. Rated 5 out of 5 by Timc from really impressed with its features and ease of use Great value for money. The part load facility is really useful. Overall we cannot fault this machine. So so glad we chose this model. Rated 4 out of 5 by Gori from Wasing machine perfect machine with 10 years parts warranty. Would have given 5 star if One touch wasn't that useless. One touch is a RFID system, not wireless or bluetooth and it thakes more time to wait the phone recognizes the machine then to set it automatically. Rated 5 out of 5 by Eamon1888 from Brilliant Been using my new Hoover washing machine for a month now & I'm really pleased with this product. Not only are the app features brilliant but it actually cleans my clothes much better than my old unit. "Very pleased"
Rated 5 out of 5 by Niamh from Very happy with my purchase I bought this washing machine just before Christmas and I have to say I’m delighted I did. It’s really user friendly and the 10kg drum takes so much at a time that my laundry time has seriously reduced. Rated 5 out of 5 by Darren from Great machine Couldn't be happier with this machine. The 10kg capacity is amazing and the quick wash functions are great too. The 59 minute daily wash is what we use the most and it washes perfectly.